There it is. Two-thirds of my apple crop for this year. 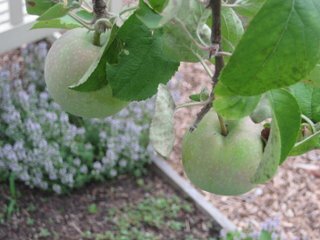 I have just one apple tree, which I planted in the center square of my raised bed vegetable garden. The variety is Red Delicious, and the only reason I have this variety is because that's what the garden center had when I went looking for a good apple tree last year. My plan, right now, is to keep this dwarf apple tree trimmed back enough so that it provides a little bit of fruit, but doesn't become a source of shade for other parts of the garden. However, the top half of the tree died out this winter, giving it a very awkward appearance, so I still have not reached a decision on whether this tree stays or goes. I am also not particularly fond of Red Delicious apples, so this may be a tree that ends up going regardless, to be replaced with a variety more to my liking. Maybe I'll pick a variety developed at Purdue University, like GoldRush? Boiler up! Sounds like if I get GoldRush, I'll also need a variety like Jonafree for good pollination. Now I have to figure out where to put a second apple tree. My dad had a "five variety" apple tree for a while. What the nursery did was graft 5 different apple buds (scions) to one root stock, so you could get more than one type of apple with only one tree. This also ensured that you would get good cross pollination from one variety to another. I don't remember the tree lasting too long. I think he got it because of the novelty of getting five types of apples from one tree, though I never remember us getting many apples at all from it, so maybe it wasn't such a good idea. I don't know what my current apple tree cross pollinated with. I guess maybe a crabapple because my neighbors don't seem to have apple trees, just some ornamental crabapples. Remember, my neighbors don't have vegetable gardens, either. I've heard that writing leads to critical thinking. So, after writing this update, I've thought through my apple tree situation and have reached a decision. This tree goes, and I will get two new apple trees that are better varieties. After all, I'm going to have to live with these trees for a good long time, hopefully, so I should have the varieties I like, right? Rest assured, however, that I won't cut down this tree or try to transplant it - does anyone want it? - until I've harvested my three apples and figured out what apple varieties I will replace it with. I have an apple tree, but I have no idea what kind. It is several years old, but so far I have not gotten an apple that lasted long enough to harvest. Maybe some day. and baking apple pies! I baked enough to last all year! Of course I froze them.This garden we planted 2 cherry trees..well you know what happened to that fruit as per my post.."Nocturnal Bandits!" I suggest Honey Crisp. It was developed by the University of Minnesota and is DELICIOUS! Best apple that I have ever eaten. It is a firm yet juicy apple, good for eating fresh, baking and canning. It is crisp and sweet as the name suggests. I suggest a visit to Mt. Vernon - George Washington's home near Washington DC. They have a bunch of fruit trees, but they are cut back so they are very small and then sort of form a fence around the garden. It's really cool-looking. Please don't "kill" the apple tree! I didn't know you had one! I am curious why you would plant a tree though in the middle of your garden?! How about planting a Granny Smith tree or a Jonathan tree for me! Something nice and tart and juicy! Our apple tree is a 5-variety type, supposed to be drawf and it is a monster. We are thinking about cutting it down. It is easier to go to the orchard. Remember on most regular apple trees the apples do all get ripe at approximately the same time. How many apples will you eat? How many pies will you bake and freeze? Cruel though it may sound,I suggest scrapping the idea.